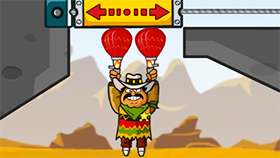 Amigo Pancho 2 is part 2 of the puzzle game series developed by Yury Koshechkin. Still with the familiar Disneycartoon style as before, howeveryou now will be saving Pancho in New York rather than the barren deserts. Pancho will still have two balloons in his hands, and you'll still have to find a way to get Pancho out of New York with these two balloons. However, the enemies in this section will be more difficult, they are eveil aliens, the fire barrels are always burning fire around ... and you have to make use of the car to push the aliens away, Or push to put Pancho in the right place, sometimes you have to use the thrust of the cork to break the obstacles on the road ... and of course, you will have to click to dissolve some project vanish To help Pancho escape safely. The fun part is that after completing stage 7, Pancho will face a rival. He also had two balloons in his hand, unlike the two white balloons of Pancho, his two balloons were black. From now on your mission is to prevent him from surpassing Pancho by trying to destroy his two black balloons. The game has a total of 25 stages. Each stage at the start will have 2000 points and the number will decrease until you complete the stage. At this point, the rest of the score is the number of points you will gain from that stage. Also, at each stage you will be able to get a maximum of three gold stars. The number of stars you receive will depend on your score. There are milestones to achieve the corresponding number of stars for each stage.